Image 1 of 13: Panorama of Casuarina. 2 of 13: The Living Room of Casaurina is spacious and bright as it is surrounded by large cathedral windows which open out to welcome the trade winds and sunshine. There is a trolley bar and an additional small refrigerator here, along with the entertainment systems. 3 of 13: Bedroom One of Casaurina is furnished with a king size bed, two side tables with reading lamps, occasional chair and chest of drawers. It is insect screened, air-conditioned and also cooled by a ceiling fan. The room has cable TV. It opens out onto the balcony. There is a safety box located in the closet. This bedroom enjoys the facilities of an en suite bathroom with shower. A hair dryer is also provided. 4 of 13: Claudette, serving on the Balcony. 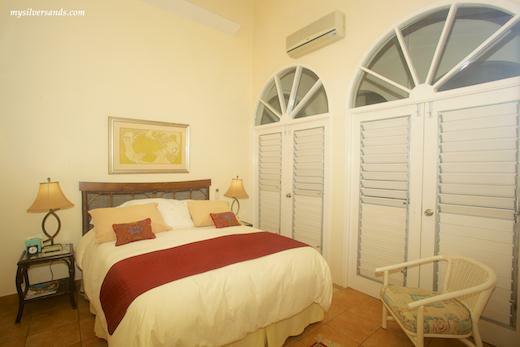 5 of 13: Casuarina is located less than two hundred feet from the white sand beach at Silver Sands. 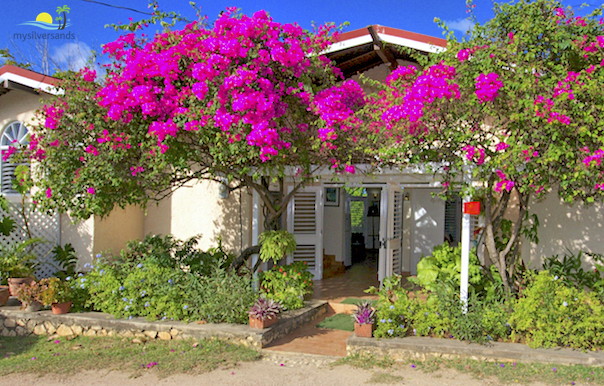 Gorgeous bouganveilla frame the entrance to this comfortable two bedroom, two bathroom cottage. An outstanding feature of the cottage is the large cathedral windows that all open out to let in the trade winds and create a light and breezy ambiance. 6 of 13: The Dining Room is slightly elevated and overlooks the Living Room. 7 of 13: Bedroom Two of Casuarina is also air-conditioned and cooled by a ceiling fan. It is furnished with a queen size bed, two side tables with reading lamps, occasional chair, and chest of drawers. It is equipped with cable television. The bathroom is located just across the passage, and features a shower. A hair dryer is provided. It has two sets of double doors which contain louvres that are screened. 8 of 13: The entrance to Casuarina is covered with bright bougainvillea flowers climbing up a pergola. 9 of 13: Sofa and dining table on the Balcony. 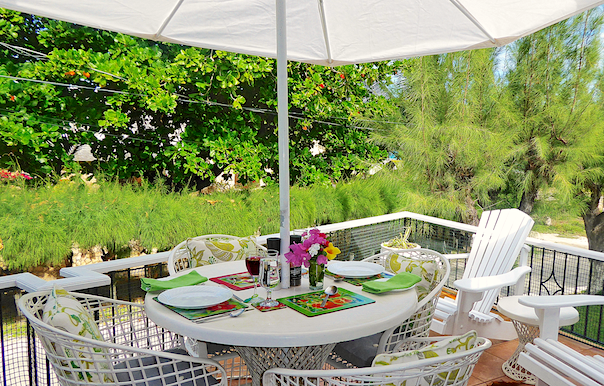 10 of 13: Enjoy outdoor dining on the Balcony where the trade winds blow in from the North Eastern shore. 11 of 13: The Dining Room is situated next to the kitchen. 12 of 13: Traci Ann, the housekeeper, adds the finishing touches to the Master Bedroom. 13 of 13: The photo shows, to the right side, the windows wrap around the living and dining room. To the left side, you can see the balcony which is accessible from the living room and bedrooms. 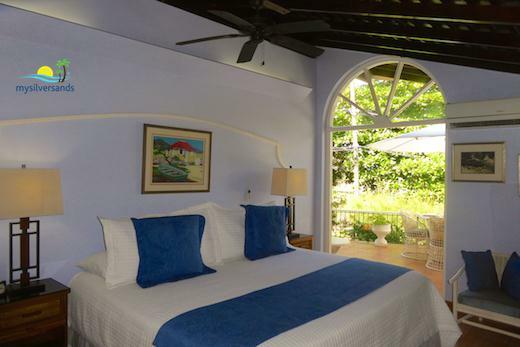 Casuarina is a beautifully decorated two-bedroom vacation rental home located less than fifty yards from the lovely white sand beach and turquoise Caribbean Sea. It’s a spacious and comfortable rental cottage for two couples or a small family wishing to enjoy a traditional beach vacation, where the natural beauty of the beach and sea is on your doorstep. Through bifold louvered doors, there is a breezy balcony on the sea side of the house with bar, barbecue, outdoor dining facilities, and lounging furniture. Elevated dining room, adjacent to the kitchen, seats up to eight persons. There is also a breakfast table for two, antique buffet and a writing desk. enjoy sea views from here. Bright and tropical spacious living room with lots of art. The living room features eight cathedral styled louvre windows and open rafter ceilings, and is very comfortably furnished with a tropical style suite. There is a second small refrigerator in the living room. Included are baby crib, booster seat, and lots of board games. Cable TV (reception not guaranteed) in both bedrooms and Living Room, DVD player, which also plays CDs, and telephone. Wheelchair friendly - except for the kitchen and indoor dining area, the cottage is all on one level. There is a small step-up at the entrance, but wheelchair users have had no difficulty negotiating this. Well-equipped kitchen, including dishwasher. Barbecue. Washer and dryer. All the louvre windows and doors have insect screens. Cook and housekeeper work a flexible 8 hour shift up to 6:00 PM. Take a look at the wide range of Suggested Menu items prepared by Claudette. Choose from this menu or make your own requests and suggestions. Casuarina Cottage costs from $199.00 to $299.00 per night.